It isn’t until the carriage ride home from the Christmas party at Randalls, to which Harriet could not attend due to her cold and sore-throat, that Mr. Elton makes his interest in Emma known. She is horrified that he is enamored of her, rather than Harriet, after such promptings on her part to put the two together. The very contrition on Emma’s part makes me feel affection for her; at least she has the sense to realize she has made a terrible blunder in her match-making attempt. The first error, and the worst, lay at her door. It was foolish, it was wrong, to take so active a part in bringing any two people together. It was adventuring too far, assuming too much, making light of what ought to be serious, a trick of what ought to be simple. She was quite concerned and ashamed, and resolved to do such things no more. ‘A man,’ said he, ‘must have a very good opinion of himself when he asks people to leave their own fire-side, and encounter such a day as this, for the sake of coming to see him. He must think himself a most agreeable fellow; I could not do such a thing. It is the greatest absurdity- actually snowing at this moment! The folly of not allowing people to be comfortable at home – and the folly of people’s not staying comfortably at home when they can! If we were obliged to go out on such an evening as this, by any call of duty or business, what a hardship we should deem it; – and here are we, probably with rather thinner clothing than usual, setting forward voluntarily, without excuse, in defiance of the voice of nature, which tells man in every thing given to his view or his feelings, to stay at home himself, and keep all under shelter that he can; – here are we setting forward to spend five dull hours in another man’s house, with nothing to say or hear that was not said and heard yesterday, and may not be said and heard again to-morrow. Going in dismal weather, to return probably in worse; – four horses and four servants taken out for nothing but to convey fie idle, shivering creatures into colder rooms and worse company than they might have had at home. I suspect that Jane Austen may have struck a chord with many people who live in Chicago and find little better to do in the winter than complain about the weather. But, it isn’t the snowy evening that I object to, it is the tediousness of keeping up a steady stream of chatter when I’d rather be reading. I lay it down as a general rule, Harriet, that if a woman doubts as to whether she should accept a man or not, she certainly ought to refuse him. If she can hesitate as to ‘Yes,’ she ought to say ‘No’ directly. It was a delightful visit; – perfect in being much too short. A sore throat! – I hope not infectious. I hope not of a putrid infectious sort. This is quite the season, indeed, for friendly meetings. At Christmas every body invites their friends about them, and people think little of even the worst weather. 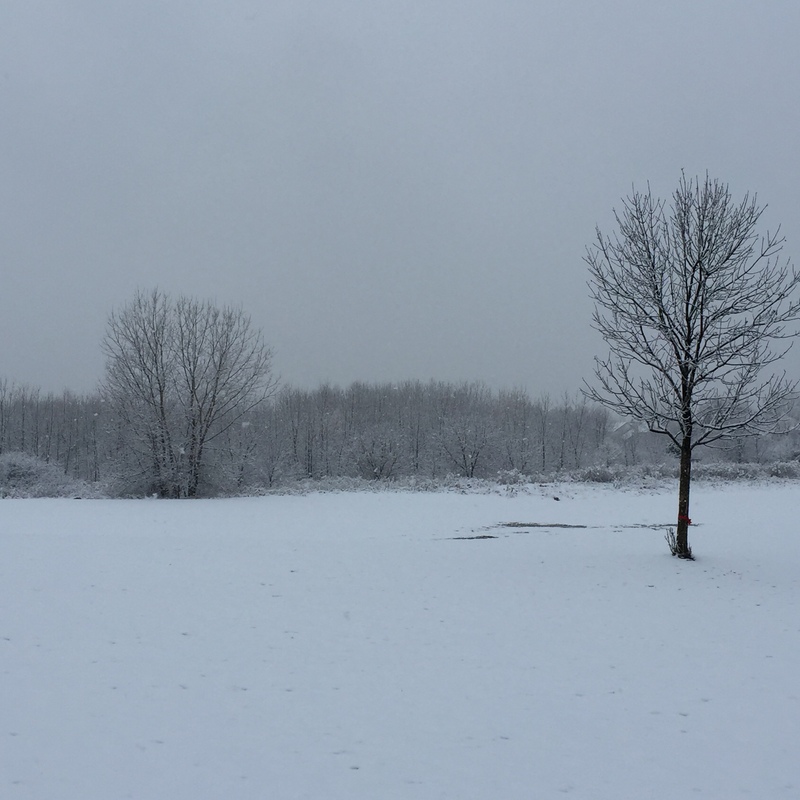 Before I go, here is the view walking into school on Monday morning, a most fetching scene for December, is it not? And, I want to ask, “What parts of Emma did you find most endearing? Or, interesting?” Please leave a link to your review so that I can visit you. I reread Emma two months ago for Austen in August, so I hope you don’t mind me jumping in here too. Rereading Austen reveals all her wonderful devices – the foreshadowing, the secrets & mysteries and the extraordinary characterisations. My reread found me focusing on Frank Churchill’s and Jane Fairfax’s character the most. I’ll include my review, but it covers the whole book, so you may want to avoid reading it if this is your first run at Emma. I look forward to seeing what you all think about it too. I love your photo – Emma is one of Austens books that is very aware of the weather and environment. 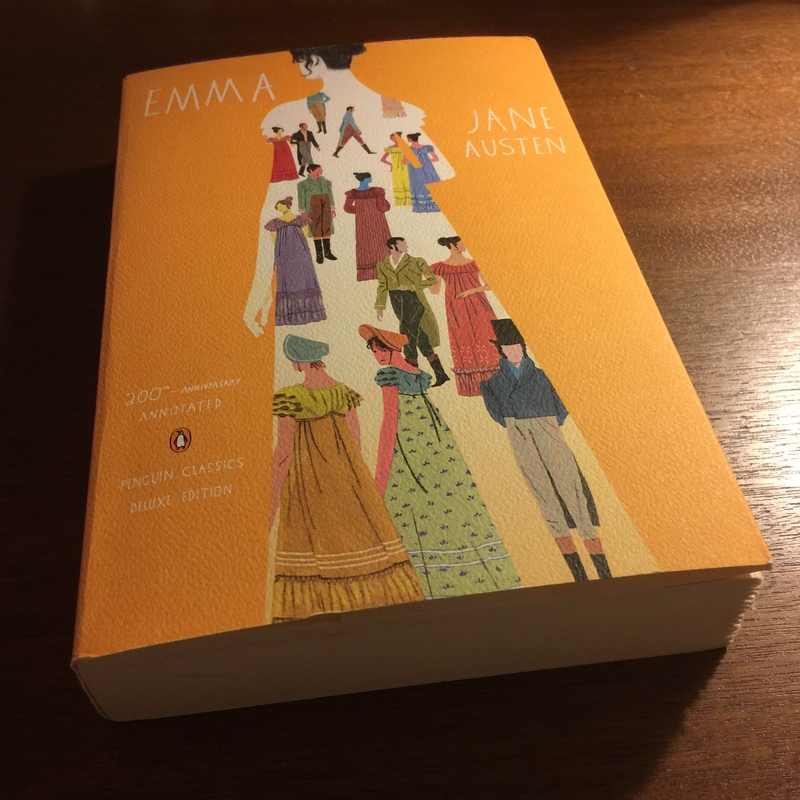 I had planned to read Emma for Austen in August, too, but I never got around to it…so glad that you jumped in! I’ll be sure to visit your post and comment when I have finished the novel. This is turning out to be one of my favorite Austen’s, but it’s only my third. Deep down, I feel the same way about most parties…except this one! I’m afraid I’ll be reading this Christmas scene a little closer to Christmastime, but I am so looking forward to it. That Christmas party/gathering was perfect for this time of year! I remember reading that Emma couldn’t go to church on Christmas Day, I believe due to weather, and that made me sad. But, the rest of that aspect of the story was priceless! A lovely review! The parts you quoted certainly appealed to this introvert 🙂 I hope you enjoy the rest of Emma, I think it’s one of her best. I’m thinking of reading these over Christmas, one of my students gave me some old copies, a set, and I really don’t recall if I have read them or not! Many participants of this read-along are choosing to read it over Christmas, which sounds perfect for both time and atmosphere. Isn’t it awful when you can’t remember if you’ve read something or not?! That happens to me sometimes, especially with the classics. Well, at least they’re often worth a reread. Especially when they are something likely to have been read as a teenager. I only remember the classics inflicted on me at school, not really those I chose to read myself! The quotations you chose are excellent, Bellezza! The photos are, too! Although I am not reading Emma right now, I enjoyed your post a great deal. You don’t have to read it with us to get much of the pleasure. Hopefully, the quotes and brief summaries will give you the picture which Austen has painted. I have to say, I have frequently thought (not uttered, mind you) what Knightley openly says. And it never snows down here, but aah how much I prefer the comforts of home to socializing outside with friends these days. Nice review. I forgot about the readalong and I intended to participate. I’m going to catch up and reread it. I love it. Everyone here has persuaded me that I need to reread _Emma_. I read it long ago but have forgotten nearly everything about the novel. Your fine posting and the comments has sent me to my bookshelf where I found the dusty old paperback. Onward with Emma! So glad you’re joining in, and onward is right! What a wonderful expression. I have never read Emma. I am having a bit of a struggle getting into it. I think it is just me and my life at present. I will continue to plug away and will check back with other read along participants. Finally getting around to reading your Volume 1 post. I’m enjoying this book so much and questioning my decision to ‘save it’ for all these years. Probably will not write about it until I’ve finished. I found the story a bit slow-going at first, but now I am hooked! I am truly enjoying this book, even though Emma makes me want to shake some sense into her. I couldn’t believe that she talked Harriet into turning down Mr. Martin’s proposal! The nerve of that girl! I was glad when Knightley told her she was wrong to do such a thing – she needs someone to tell her the truth, since everyone else is so enamored with her. As for Elton – how could Emma not realize how much he liked her? It was so obvious! By the by, your lovely photo gave me chills!